Delayed post from the weekend, I'll explain probably later in the week. 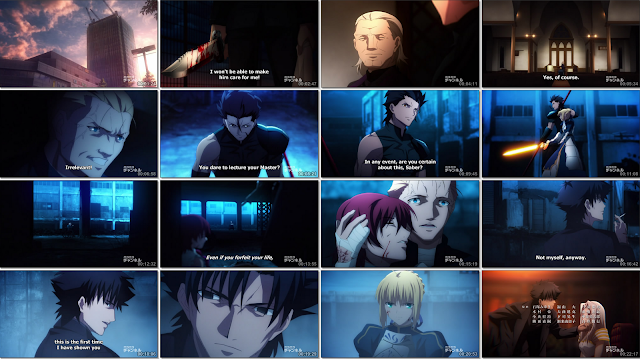 As always, Fate/Zero shows off their extremely high budget they have in their battle scenes. When you are such a large cut above everyone else, it is very noticeable. This was the fated episode I was waiting for quite some time for, it turned out to just as great as my expectations, which is quite rare. 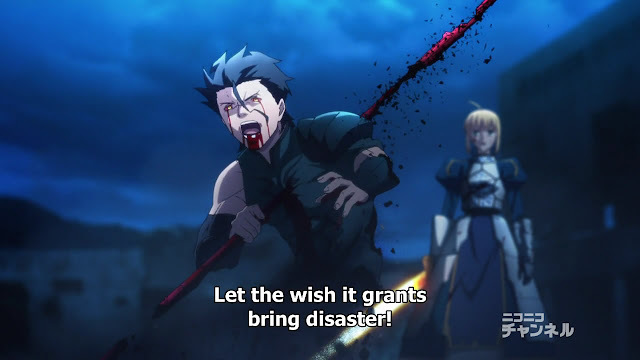 I guess the mark of caster going crazy was not enough to signal that this grail war has gotten out of hand. 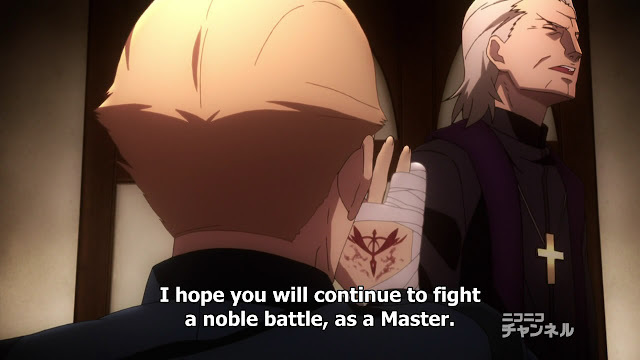 (Pun intended) I mean, why was Kayneth even surprised that he got killed by an underhanded trick in the end? 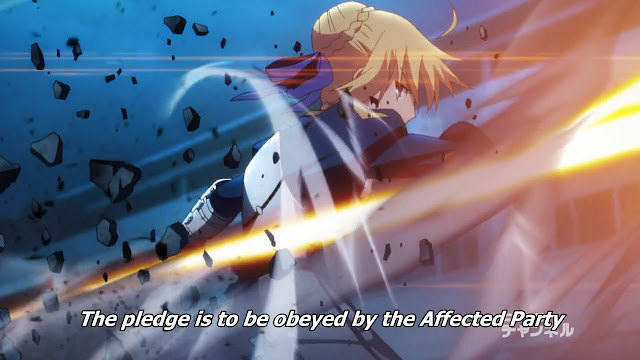 He did the same thing here, even used a gun that he shunned earlier in the season as unfitting of a mage. How quickly the tables turn when he becomes fast wheels. They captured this moment absolutely flawlessly. You could literally feel the intensity of his rage. To see such a simple goal crushed like that is terrible. I mean, he didn't even care about winning, he just wanted to serve his master faithfully for an hounourable battle. The cursed fate of Lancer, that mole under his eye just serves to push his NTRing legend further. The fate of all Lancer's in all shows is grim: Kanade (Symphogear), Kyouko, and all the Lancers of the nasuverse seem to suffer the same ill fate. 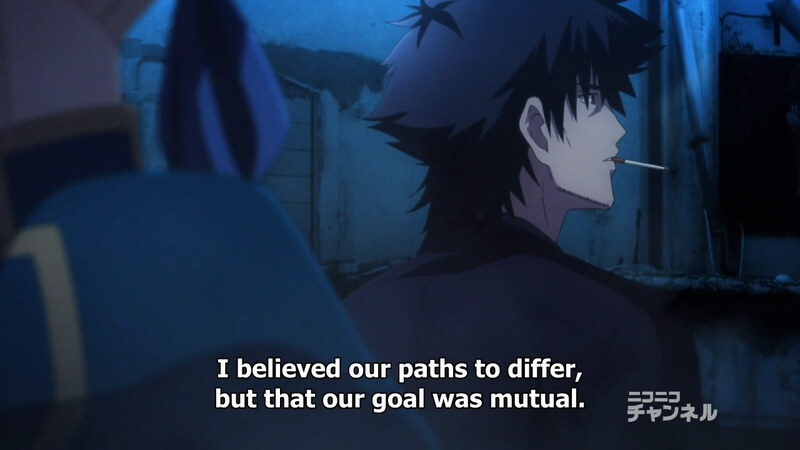 As logical as Kiritsugu is about chivalry, I must disagree. Chivalry is giving means to senseless bloodshed, but it also gives purpose and a way to gauge your "worth". I mean, just because religion is all lies, I wouldn't go on a crusade to purge it. It gives some people a reason to get up in morning and a reason to be. The second thing is competition. Competing with one another will be something that will never go away. I see chivalry as a set or rules both sides agree upon so that they maybe able to test their abilities against another. A way to gauge who is "best". After all, everyone wants to be the best, chivalry is just the rules which they agree upon to fight on to determine it. Chivalry is by no means, "evil". That concludes probably the best episodes of Fate/Zero so far, can't wait to see how this all plays out.